Jeff and Maxine Kluckhohn are the present day owners. When Sunnybrook Fence & Deck started in 1997, we did it all — estimating, fabricating, assembling, and installing. We quickly discovered there was an untapped market for vinyl fencing and decking, and our focus shifted towards the wholesale distribution and fabrication of vinyl products. Today, we are a leader in the design and fabrication of vinyl fencing and decking. Throughout the years, our commitment to our customers has always been our top priority. We may be a small-town business, but we understand big-time dreams. Today, we work with many fence companies, subcontractors, home builders, home remodelers, commercial developers, general contractors, pool companies, and landscapers throughout the Midwest. Our current facility sits on 155 acres just outside of Neillsville, Wisconsin. The main vinyl fabrication shop is approximately 5,000 square feet and houses two CNC routing machines. These machines are computer-controlled units that make or "rout" the holes in the fence or deck profiles. 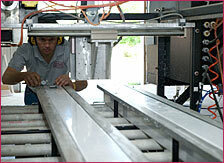 One of the machines is a single-bay unit, used mainly to rout posts. The other is a two-bay unit, used to rout fences and rails. With this computerized routing system, we are able to specialize in custom vinyl fabrication. Modifications to height, picket spacing, panel length, and so on can be customized to meet the needs of our customers. 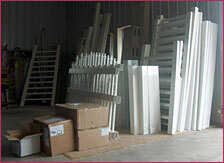 In addition, we have a large, 40,000 square foot, inventory warehouse storage facility on-site. 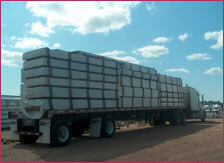 Inventory arrives by the semi-load as blank profiles, and we custom cut and rout the material to job specifications. Then, we assemble and package the products for delivery.